Deborah Ann “Debbie” Gibson (born August 31, 1970) is an American singer-songwriter, record producer, and actress. In 1988 she was pronounced the youngest artist to write, produce, and perform a #1 single on the Billboard Hot 100, with her song “Foolish Beat” and she remains the youngest female to write, record, and perform a #1 single.She has gone on to starring roles on Broadway and touring musicals, as well as independent film and television work. She continues to record, and reached the Billboard Adult Contemporary chart as high as #24 during 2006 in a duet with Jordan Knight titled “Say Goodbye”. In 2010, the album Ms. Vocalist, from Sony Japan was Top 10 on the Japanese Billboard chart and the first single from the album, “I Love You”, hit #1. Electric Youth was released in early 1989, and spent five weeks at #1 on Billboard’s Top 200 Album Chart. The first single released, “Lost in Your Eyes”, was #1 on the Billboard Hot 100 for three weeks, garnering her another achievement as the first female to have both an album and single simultaneously at #1. (She shared the 1989 ASCAP Songwriter of the Year Award with Bruce Springsteen.) 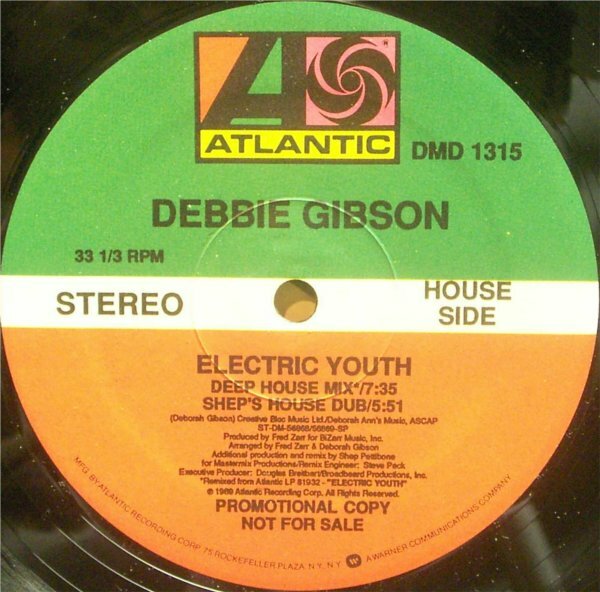 Subsequent singles from the album were “Electric Youth” (#11), “No More Rhyme” (No. 17), and “We Could Be Together” (No. 71). The Electric Youth album was certified 2x platinum by the RIAA. The successful “Electric Youth” world tour and Live Around the World VHS (2x platinum) followed. The “Electric Youth’ CD Maxi Single featured five Shep Pettibone remixes but I have recently purchased the 2 x 12” US Promo which features an additional 4 Shep mixes that I had never heard before.